by Chl. A. Leale, Asst. Surgeon US Vol. Executive Officer, Armory Square U.S.A. Hosp[ita]l. Washington D. C.
Having been the first of our profession who arrived to the assistance of our late President, and having been requested by Mrs. Lincoln to do what I could for him I assumed the charge until the Surgeon General and Dr. Stone, his family physician arrived, which was about 20 minutes after we had placed him in bed in the house of Mr. Peterson opposite the theatre, and as I remained with him until his death, I humbly submit the following brief account. I arrived at Ford's Theatre about 8 1/2 P.M. April 14/65 and procured a seat in the dress circle about 40 feet from the Presidents Box. The play was then progressing and in a few minutes I saw the President, Mrs. Lincoln, Major Rathbone and Miss Harris enter; while proceeding to the Box they were seen by the audience, ^[insert] who cheered [/insert] which was reciprocated by the President and Mrs. Lincoln by a smile and [strikethrough] a [/strikethrough] bow. The party was proceeded by an attendant who ofter opening the door of the box and closing it after they had all entered took a seat near by for himself. The theatre was well filled and the play of "Our American Cousin" progressed very pleasantly until about half past ten, when the report of a pistol was distinctly heard and about a minute after a man of low stature with black hair and eyes, was seen leaping to the stage, beneath holding in his hand a drawn dagger. While descending his heel got entangled in the American flag, which was hung in front of the box, causing him to stumble when he struck the stage, but with a single bound he regained the use of his limbs and ran to the opposite ^[insert] side [/insert] of the stage, flourishing ^[insert] in his hand a drawn [/insert] [strikethrough] his [/strikethrough] dagger and disappearing behind the scene. I then heard cries that the "President has been murdered", which were followed by those of "Kill the murderer", "Shoot him" etc. which came from different parts of the audience. 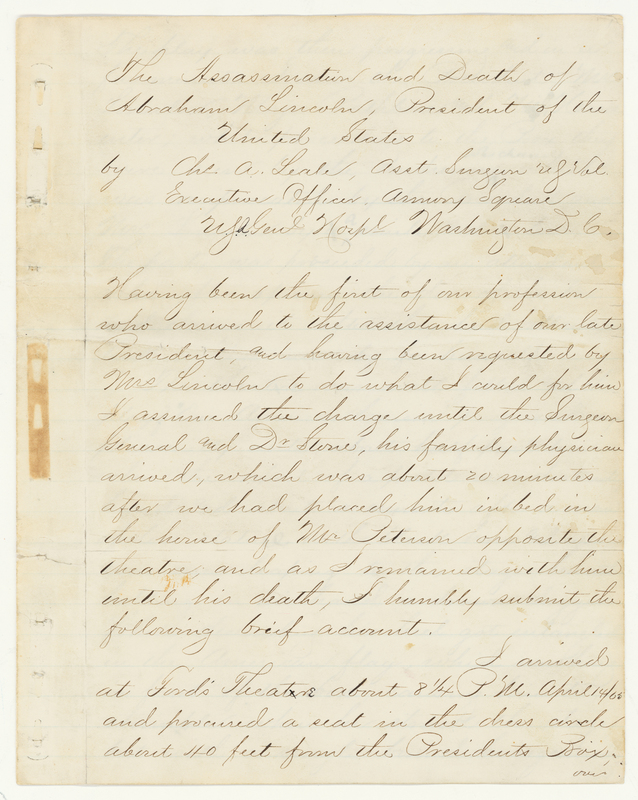 I immediately ran to the President's box and as soon as the door was opened was admitted and introduced to Mrs. Lincoln, where she exclaimed several times "O Doctor, do what you can for him, do what you can"! I told her we would do all ^[insert] that [/insert] we possibly could. When I entered the box the ladies were very much excited. Mr. Lincoln was seated in a high backed arm-chair with his head leaning towards his right side supported by Mrs. Lincoln, who was weeping bitterly. Miss Harris was near her left and behind the President. While approaching the President I sent a gentleman for brandy and another for water. When I reached the President he was in a state of general paralysis, his eyes were closed and he was in a profoundly comatose condition, while his breathing was intermittent and exceedingly stertorous. I placed my finger on his right radial pulse but could perceive no movement of the artery. As two gentlemen now arrived, I requested them to assist me to place him in a recumbent position, and as I held his head and shoulders, while doing this my hand came in contact with a clot of blood near his left shoulder. Supposing that he had been stabbed there I asked a gentleman to cut his coat and shirt off from that part, to enable me if possible to check the haemorrhage, which I supposed took place from the subclavian artery or some of its branches. Before they had proceeded as far as the elbow I commenced to examine his head (as no wound near the shoulder was found) and soon passed my finger over a large firm clot of blood, situated about one inch below the superior curved line of the occipital bone and an inch and a half to the left of the median line of the same bone. The coagula I easily removed and passed the little finger of my left hand through the perfectly smooth opening made by the ball and found that it had entered the encephalon. As soon as I removed my finger a slight oozing of blood followed and his breathing became more regular and less stertorous. The brandy and water now arrived and a small quantity was placed in his mouth, which passed into his stomach where it was retained. About 2 A. M. the Hospital Steward, who had been sent for a Nelatons probe, arrived and an examination was made by the Surgeon General, who introduced it to a distance of about 2 1/2 inches, when it came into contact with a foreign substance, which laid across the track of the ball. This being easily passed the probe was introduced several inches further, where it again touched a hard substance, which was at first supposed to be the ball, but as the bulb of the probe on its withdrawal did not indicate the mark of lead, it was generally thought to be another piece of loose bone. The probe was introduced a second time and the ball was supposed to be distinctly felt by the Surgeon General, Surgeon Crane and Dr. Stone. After this second exploration nothing further was done with the wound except to keep the opening free from cogula, which if allowed to form and remain for a very short time, would produce signs of increased compression; the breathing becoming profoundly stertorous and intermittent and the pulse to be more feeble and irregular. His pulse which was several times counted by Dr. Ford and noted by Dr. King, ranged until 12 P. M. from between 40 to 64 beats per minutes, and his respiration about 24 per minute, were loud and stertorous. At 1 A. M. his pulse suddenly increased in frequency to 100 per minute, but soon diminished gradually becoming less feeble until 2:54 A. M. when it was 48 and hardly perceptible. At 6:40 A. M. ^[insert] his [/insert] pulse could not be counted, it being very intermittent, two or three pulsations being felt and followed by an intermission, when not the slightest movement of the artery could be felt. The inspirations now became very short and the expirations very prolonged and labored accompanied by a guttural sound. 6.50 A.M. The respirations cease for some time and all eagerly look at their watches until the profound silence is disturbed by a prolonged inspiration which was soon followed by a sonorous expiration. The Surgeon General now held his finger to the carotid artery, Col. Crane held his head, Dr. Stone, who was sitting on the bed, held his left pulse, and his right pulse was held by myself. At 7.20 A.M. he breathed his last and "the spirit fled to God who gave it." During the course of the night the room was visited by many of his friends. Mrs. Lincoln with Mrs. Senator Dixon came into the room three of four times during the night. The Presidents son, Captn R. Lincoln, remained with his father during the greater part of the night. Immediately after death had taken place, we all bowed and the Rev Dr. Gurley supplicated to God in behalf of the bereaved family and our afflicted country.